Join us tomorrow night at 6 pm for the RDA civic forum, Resilience H2Ouston: Living in Flood Plains, at the Cherie Flores Garden Pavilion inside the McGovern Centennial Gardens at Hermann Park. The event is free and open to the public. Parking is also free and is in the surface parking adjacent to the Centennial Gardens. RDA Civic Forums are made possible by our 2017 Underwriters and our sponsors, including Minnette and Peter Boesel, DLR Group, Hoar Construction, Skanska USA Commercial Development, Telios, and Vaughn Construction. The Cherie Flores Garden Pavilion is located at 1500 Hermann Drive, Houston, TX 77004. H2Ouston, RDA’s 41st annual Architecture Tour, features homes and buildings in Houston built on flood plains. The six self-guided tour stops, selected based on demonstrated resilience to past flood events, span from construction in 1910 to 2017. Purchase tickets here for the tour. RDA member tickets: $25. Student tickets (with ID): $15. All others: $35. Tickets will also be available for purchase at the March 8 civic forum. If you are an RDA member, volunteer to be a docent on the tour for the opportunity to purchase one docent ticket at a discounted rate of $15. Signup online. 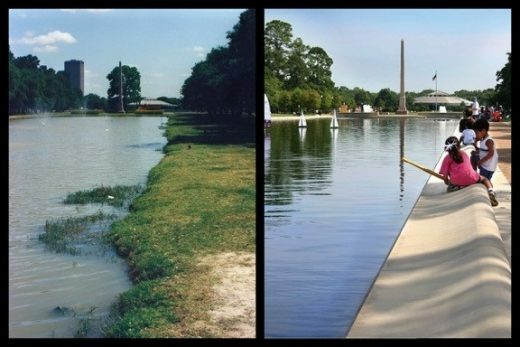 Did you know that Rice Design Alliance held a civic forum in 1973 that addressed the bayous, flooding, landscape, and many of the same issues we are still talking about 44 years later? In Offcite, editor Raj Mankad has published a 2008 interview between legendary environmentalist and volunteer Terry Hershey and former Houston Endowment executive Ann Hamilton, which also discusses the bayous. The interview is part of the Houston Oral History Project. It is with immense gratitude for her 28 years as the RDA executive director that I am writing to announce the retirement of Linda Sylvan this summer. I hope you will join me in wishing her the best in her plans to take on consulting work, volunteer, and spend more time with her family. In 1988, Linda took on the executive director role when RDA was in debt and had only one other staff member. Under her leadership, the staff, board and membership have grown, and contributions and grants have balanced the budget. Moreover, RDA has become a respected and influential group within Houston, and a national model for public engagement around design. * Linda organized the Heart of the Park Competition with the RDA board. The winning entries spurred the newly formed Friends of Hermann Park to commission and implement Laurie Olin’s master plan. In this effort and many others, Linda played a critical role in Houston’s “green transformation” that has recently garnered national attention. * Before becoming RDA executive director, Linda was managing editor of Cite. As executive director, she was akin to publisher. She nurtured Cite through many different editorial teams and formats, including the Cite anthology, Ephemeral City. This incredible body of criticism, commentary, history, and interventions would not exist without her grace and grit. * Through countless tours and forums and parties, Linda cultivated a broad community that includes professors, architects, engineers, builders, designers, developers, artists, writers, politicians, civil society, and more. In this time when our society may seem divided, Linda’s ability to not only get people into the same room but move them to work for the common good will be sorely missed. Fortunately, Linda is remaining in her position as a search is conducted to find a new executive director. Please share the job description widely. And, once again, thank you Linda for all you have done to make the built environment and public life of Houston so much more vibrant and beautiful. Linda can be reached via email if you’d like to send her a note. HOUSTON, TEXAS (February 17, 2015) —Buildings are responsible for a large proportion of greenhouse gases, but new construction methods could dramatically cut emissions. This forum continues the discussion from the RDA Fall 2016 lecture series where mass timber construction was explored. RDA Civic Forums are made possible by Generation Park, Louisa Stude Sarofim, Cardno, D.E. Harvey Builders, Hines, Houston First Corporation, TDIndustries, and Walter P Moore. Sponsorship support comes from Minnette and Peter Boesel, DLR Group, Hoar Construction, Skanska USA, Telios, and Vaughn Construction. For more information, please visit ricedesignalliance.org. The forum is paired with RDA’s annual architecture tour, which presents six buildings located in flood plains. The tour titled H2Ouston: Living in Flood Plains, will take place March 25-26. HOUSTON, TEXAS (February 17, 2017) — A series of catastrophic floods has left Houstonians looking for large-scale solutions. Some solutions can be found at the level of the individual house. This year, the Rice Design Alliance (RDA) annual architecture tour explores the ways architects have adapted to design for resilience within our flood plains. “We can learn lessons from older buildings that have survived floods and find inspiration from innovative new buildings that find opportunities for beauty in challenging contexts,” says tour chair Florence Tang, who oversaw the selection of the houses on the RDA tour, now in its forty-second year. RDA has organized tours every year since 1975 to help Houstonians experience firsthand the most interesting works of architecture, landscape, and interior design in the city. The tour is open to the public. Current RDA members may purchase discounted tickets for $25. RDA membership is open to all. Tickets for nonmembers are $35. Tickets are $15 for students with ID. Please visit ricedesignalliance.org for more information and to purchase tickets, join RDA, or renew your membership. H2Ouston is made possible by Generation Park, Louisa Stude Sarofim, Cardno, D.E. Harvey Builders, Hines, Houston First Corporation, TDIndustries, and Walter P Moore. Sponsorship support comes from Agile OFIS, Anslow Bryant Construction, ARC Document Solutions, Austin Commercial, Avadek Canopies & Walkway Covers, Brookstone, Builders West, Endurance Builders, Fellert North America, GSMA, McCarthy Building Companies, Inc., Mechoshade, Midway, Office Pavilion, Parra Design Group, PDR, Rogers O’Brien Construction, Tellepsen, Trammell Crow Company, Walker Engineering, Weaver, The Woodlands Development Co., WSP, and Wylie Consulting Engineers. 19 Sep 2013 – The RSA/RDA fall lecture series, RE:ARCHITECTURE [NSFW], starts next week with architect Meejin Yoon! Meejin Yoon is founder of MY Studio, co-founder of Höweler + Yoon and an Associate Professor in the Department of Architecture at the Massachusetts Institute of Technology. Yoon has been awarded the 2008 United States Artist Award in Architecture and Design, the 2007 Architect League’s Emerging Voices Award, and the 2005 Rome Prize in Design. The lecture series, curated by Rice Assistant Professor of Architecture Troy Schaum, features young firms that are building in unique ways and refuse to play it safe. The series will highlight a new generation of architects attempting to engage architecture by operating nimbly across scales, methods, techniques, and sites of work. Framed by the popular online tag, Re: Architecture [Not Safe For Work] investigates how architects’ assumptions regarding safe boundaries for contemporary disciplinary investigation simultaneously limit and propel their creative practices. We hope that you can join us next Wednesday, September 25 at the MFAH for the lecture at 7 p.m. in the Brown Auditorium and a pre-lecture reception starting at 6 p.m. sponsored by Clark Condon Associates in the Caroline Weiss Law Building lobby. Special thanks to our sponsors: ARC Document Solutions; Austin Commercial; Brochsteins; CEMEX; Chamberlin Roofing & Waterproofing; Fast Track Specialties, Inc; Gensler; HBL Architects; HBL Architects; D. E. Harvey Builders; Haynes Whaley Associates, Inc.; Jackson & Ryan Architects; Kendall/Heaton Associates; McKinnon Associates; Miller Dahlstrand Architects; Morris Architects; PM Realty Group; Satterfield & Pontikes Construction, Inc.; Shah Smith & Associates; The Southampton Group; Walter P Moore; Ziegler Cooper Architects; the Corporate Members of the Rice Design Alliance; the City of Houston through the Houston Arts Alliance, and the Texas Commission on the Arts. In June 12 – 19, 2012, RDA tour-goers will travel to Rio de Janeiro and Brasilia, accompanied by Rice School of Architecture professor Farès el-Dahdah and architectural historian Stephen Fox. The trip includes expert guides, private tours and receptions, and a once-in-a-lifetime experience. If you would like to participate in this exciting travel opportunity, please let us know as soon as possible as there are only a few places left on this tour. A lecture series focusing on the impact of the thirty-year building explosion in China. “The lecture series will be a great opportunity to see design being done in China in the context of tremendous growth,” says RDA board member and Chinese Architecture steering committee member Camilo Parra. Read up on the series and learn how much China’s growth parallels Houston’s own with a great piece in the Houston Chronicle written by fellow board member, Christof Spieler. As a friend of RDA, we think you will be interested in attending a lecture and book signing with Lars Lerup, professor and former dean of the Rice School of Architecture, presented by The MFAH Bookstore. You can reserve a copy of the book by calling 713.639.7360. MFAH Members receive a 10% discount. LA DALLMAN was named a 2010 Emerging Voice by the Architectural League of New York and was a recipient of the national 2007 Bruner Award for Urban Excellence Silver Medal. The firm is responsible for such innovative projects as the Miller Brewing Employee Meeting Center, the Marsupial Bridge, the UWM Hillel Student Center, and the “City of Freshwater and Great Lakes Future” permanent exhibits at Discovery World; among countless others. PLACE: Brown Auditorium, The Museum of Fine Arts, Houston 1001 Bissonnet. Additional parking is available until 7 p.m. for $6 in the museum garage located at the corner of Binz and Fannin Streets. TICKETS: This event is free for RDA Members and students presenting identification. Tickets for non-members are $25, but those who join RDA that evening will receive a free ticket. Tickets are required for entry and will be distributed on a first-come, first-served basis starting at 6 p.m. the evening of the lecture. Seating is limited; attendees are encouraged to arrive early. March 7, 2017 in Events. Tags: Events, To see all listed projects on a single map please follow this link.